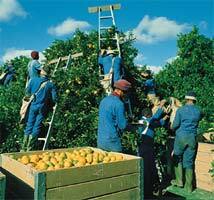 Despite mechanisation, picking is still exclusively done by hand to protect the fruit. Once picked the fruit is transported to Goede Hoop Citrus (Pty) Ltd. where its first de-greened (if necessary), washed, treated and then coated with a layer of wax for aesthetic appeal and to prolong its shelf-life. 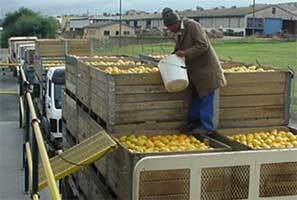 The fruit is lastly sorted and inspected for quality, sized and finally packed into cartons for shipment. Embracing the advantage of being a ‘Black Spot Free Area’ the citrus prepared and packed by the company, is exported to almost every country in the world. 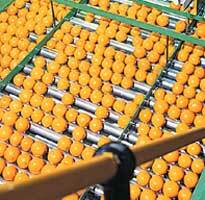 Goede Hoop Citrus (Pty) Ltd only uses leading and prominent exporters and packing is done in the format of the exporter’s choice. 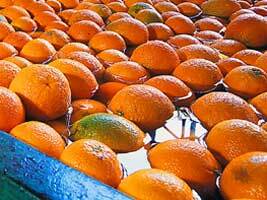 The citrus fruit is harvested all over the Olifants River Valley. and random fruit samples are taken for analysis. If necessary, the fruit is de-greened in these de-greening chambers. 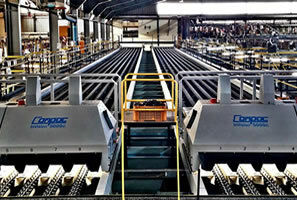 Before entering the packing plant, the fruit is washed and treated. 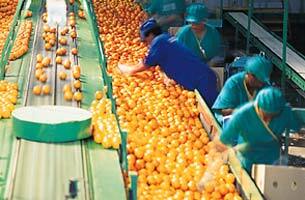 Quality control is done by hand and any fruit not suitable for export is removed for juicing. Here the fruit appears after receiving a protective wax coating. The wax increases the general appeal and prolongs shelf life. This machine sorts the delivered fruit according to size and colour. 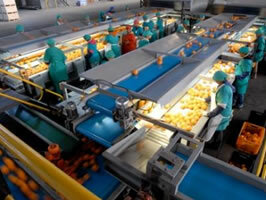 Skilled workers pack individual cartons by hand. 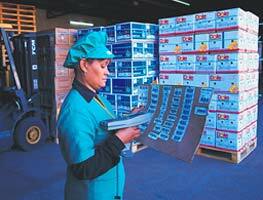 The packed cartons are inspected by PPECB staff. Ready for export the packed fruit is placed on palettes for loading.